We have great vacation rentals available for the whole family, we mean everyone - even the dog! We know that pets are an important part of the family, and finding a pet-sitter can be an expensive hassle when planning a vacation. That is why we offer a number of downtown Bozeman, West Yellowstone and Big Sky pet friendly lodging options. With each location offering unique amenities for our guests and their furry friends! Our pet-friendly vacation homes give guests a chance to easily explore the surrounding areas, with so much to do, you won't be board! Restaurants, specialty shops, and access to hiking trails and outdoor adventure are all at your fingertips! For a stay in the city, we offer cozy studios, with natural light pouring in large windows overlooking the Main street and the Bridger Mountains. Sip coffee on the balcony or take advantage of the fitness center! 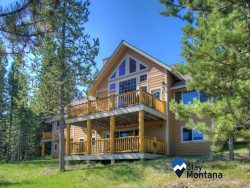 Modern, clean designs meet rustic Montana outdoors for an experience you wont forget! Our online booking makes for a simple and stress-free reservation process, and our experienced staff are available to answer any of your questions. Be sure to check in and ensure Fido can come before you book your next getaway with Stay Montana today! Contact our office with any pet friendly questions!